Choosing which university to invest your money in is never an easy choice, especially when it comes to graphic design. Even as a recent industry, more and more institutions are paying attention to the number of students who wish to get formal education on digital art, which means a ton of options available for you as a potential student. Making that choice can be pretty hard, which is why we gathered the top schools that offer a graphic certificate or degree in Massachusetts. The Graphic Design program at Boston University is committed to helping students understand the latest developments in interactive and expressive Graphic Design. Majors at Boston University can expect to be exposed to both modern media creation methods and platforms alongside traditional print media education. The areas of learning in this degree include experience design, information design, web design, editorial publication, multimedia design, 3D design and computer animation, drawing into animation, and video art. These areas combine to create a holistic and thorough understanding of the skillset required for the modern graphic design industry. The College of Arts, Media and Design (CAMD) at Northeastern University prides itself on being a community of collaborators and creators, creating an environment that is ideal for discovery, research, and inspiration in the fields of arts, media, and design. Students of this program are taught to create work that informs cultures, empowers the global marketplace of ideas, and benefits society. There is a broad range of disciplines and opportunities that this program offers its students, combining to create an education that emphasizes visual fluency in today’s technology-driven world. The Graphic Design program at Stonehill College covers everything from advertising and publishing to screen-based design. Students of this program graduate with experience in extensive internships and become knowledgeable of a world-class on-campus design studio that ensures they are ready to enter the graphic design world. Alongside coursework, students develop a professional portfolio, in which they learn how to work independently and with a full team, as the course understands the differences in possessing skillsets for both areas. Finally, students can expect to work very closely with a faculty advisor in building their portfolio, all of whom possess professional experience in the industry. 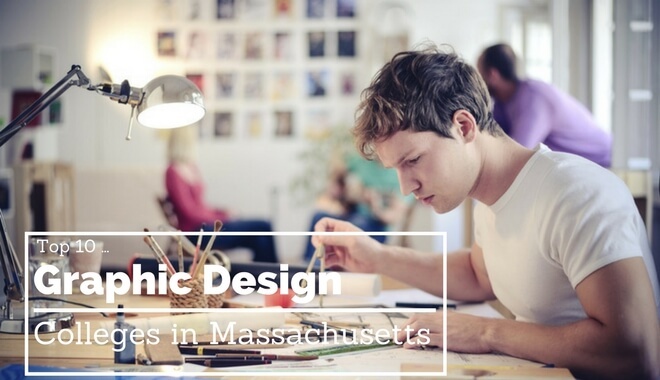 Mount Ida College’s Graphic Design program is a multi-faceted experience that aims to develop a sufficient mastery of traditional skills combined with an understanding of recent technological skills. The program accomplishes this by exposing its students to hands-on learning with various computer applications and software, making use of the latest in technological systems related to graphic design. Students can expect to learn how to become critical and creative thinkers when dealing with design-related problems. The main goal of Mount Ida College’s Graphic Design program is to produce students who are capable of integration information and form for the ideal purpose of maximum visual communication. With small class sizes and individual teaching, students are offered the best personalized experiences. The Graphic Design program offered by Endicott College is a four-year degree program that equips students with the abilities to succeed in careers in the modern practices of graphic design, including motion graphics media, animation, branding, interactive, web, and print. They aim to create students that are multidisciplinary and collaborative, ready to adapt and fit into the ever-changing world of graphic design. Students are turned into information strategists whose main goals are to communicate complex ideas in simple yet effective ways. This program addresses the transformation of the design profession from its traditional foundational levels to the time-based and interactive media popularized today. Graphic Design students at Assumption College are taught to maximize their communication through combined forms, information, and content styles. What’s unique about Assumption College’s graphic design program is that it is an ongoing collaboration between the business and art departments of the school, covering various skillsets including marketing, motion graphic design, illustration, drawing, photography, web design, typography, and more. Students can also expect to gain sizeable experience with the latest in graphic design technology and software. Students are also offered a variety of opportunities beyond the classroom, including internships, the graphic design club, and art club. The Graphic Design program at Newbury College is a three-year degree program with selective standards, requiring students to have at least a high school GPA of 3.50 to qualify for admission. This program focuses on boiling the usual four-year graphic design program into a more compact three years, by emphasizing on small classrooms and personalized educational needs. Like other graphic design programs, Newbury College offers all the basic foundational learning and skills for students to enter the graphic design industry prepared and ready, alongside more advanced technological and software understanding. The Graphic Design program offered by Lasell College revolves around the understanding that culture is, first and foremost, visual. Imagery plays a major role in communicating meaning and ideas, and this program focuses on equipping students with the abilities to most effectively communicate. Whether this communication is to promote an idea or product or to help establish a brand or major message, students will find themselves ready to tackle these problems and situations with all the tools of a professional and skilled graphic designer. Students of both design and fine arts will find themselves with a graphic design degree that emphasizes both the practical and theoretical studio experience, adding value to their lives as communicators and designers. The Communications Media program with a concentration in Graphic Design offered by Fitchburg State University equips students with a professional learning environment that encourages the development of personal artistic growth and creative thinking. The program promotes a steady balance of both design practice and design thinking elements, allowing students to choose which specialized aspects of the graphic design field they wish to pursue. A variety of skills are introduced to the students, including Advanced Graphic Design, Publication Design, Interface Design, Motion Graphic Design, Illustration, Typography, Computer Graphic Design, and Graphic Design. The Graphic Design program offered by Anna Maria College is based out of their School of Visual and Performing Arts, emphasizing their focus on the more creative and visual aspects of graphic design. Class related activities and coursework encourage the understanding of contemporary developments in visual communication, imaging, and art as expressed in a variety of media, such as motion graphics, web-based media, interactive, and print. Students can expect to tackle projects that can only be completed through diverse approaches to most effectively express complicated ideas. This program addresses methodology, theory, and technology in graphic design, fully preparing students to fit in the fast-paced and ever-evolving theoretical and technological environment of the graphic design industry.